Uses newly available GDP data in 2011 PPP through 2015, CO2 FF data through 2015, and Land use CO2 through 2014. Updated starting years to 2017. Removed the graphical input entry feature. Inputs for Deforestation and Afforestation are now a 0-100% scale, replacing the 0-1 scale. When using World Climate mode in either 6 or 3 region, the default graph for emissions is CO2 Fossil Fuel Emissions. Added graphs for Deforestation and for afforestation to the World Climate simulation mode. Change input for Deforestation in World Climate mode—The input for deforestation is now set up as effort to prevent deforestation, a 0 to 1 scale. Input a value between 0 and 1 to adjust the level of CO2 emission reductions in land use and forestry. 0 – represents no change from the business as usual scenario and yields constant emissions (5.4 GtonsCO2/year) from deforestation through 2100. 0.5 – yields a drop of 50% emissions by 2050, and then remains at that level until 2100. 1 – is the equivalent of eliminating all deforestation globally by the year 2050. Changes to the Welcome screen and dedicated World Climate 6-region and 3-region modes. From the Program settings screen you may set the model to open with the graph for “Temperature and Goal” graph to either °F or °C. When the simulation is running you still have the ability to shift between °F and °C from the “Settings” tab. In the “Settings” tab you may show or hide the effects of the INDCs from COP21 (last updated 4-Apr-16). The final temperature in 2100 is displayed at the top of the screen in both °F and °C. The default Reference Scenario is now calculated to be consistent with IPCC’s Fifth Assessment Report (AR5) and captures the relationships of population, GDP per capita, and emissions per GDP. Population defaults to use the UN’s medium fertility projections (UN, 2015). GDP is consistent with the Shared Socioeconomic Paths (SSPs). It is determined as the product of population and GDP per capita, which, for each of the model’s 20 regions, is a function of its starting value from history and projected rate of change. These projected rates start at levels consistent with historical data and converge to 1%/year over region-specific times aimed to achieve long term convergence of GDP per capita. Comparable to GDP per capita, Reference Scenario emissions of each GHG are consistent with Representative Concentration Pathway 8.5 (RCP 8.5) and are determined as the product of population, GDP per capita, and emissions per GDP. Likewise for GDP per capita, emissions per GDP of each GHG is a function for each of the model’s 20 regions of its starting value from history and projected rate of change. The starting rate of each region converges to a minimum GHG-specific rate over times aimed to achieve long term convergence of emissions per GDP. Updated the settings files for INDCs to the most recent pledges. Added a feature that will use a settings file (.cin) to create a results file (.vdf). This is a new button on the ‘Welcome’ page— ‘Settings —>Results’— which simplifies the updating of results files for use in Uncertainty analysis. Graph line thickness may be adjusted from the ‘Settings’ Tab. This applies to small and large graphs. Removed obsolete reference scenarios– EMF22 series and SRES series. C-ROADS has been calibrated to the latest Intergovernmental Panel on Climate Change (IPCC) report (AR5) and now uses the IPCC’s RCP8.5 scenario as the default or reference scenario representing business as usual. Settings files have been packaged with C-ROADS that allow users to load the intended nationally determined contributions (INDCs) that countries have submitted for the upcoming climate negotiations. We have also included a 3-region World Climate mode that divides the world into Developed Countries, Developing A Countries, and Developing B countries for the World Climate Exercise. The lower limit of climate sensitivity can now go as low as 1.5°C (rather than 2°C). Graphs are provided with comparisons between C-ROADS projections for temperature and CO2 concentration to those of RCP 8.5, 6.0, 4.5 and 2.6. Population scenarios that match the UN may be adjusted. Historical data was updated to include most recent available, and all start years were updated to be 2015. The Excel and Non-Excel input versions have been combined in a single C-ROADS version. We have created a modified version of C-ROADS, v3.015.02X that does not require Excel to run. Either version is available from the download link. The default download is the non-Excel version. Corrected a miss-assigned input slider for the Goal line for CO2e on the Atm CO2e and Goal graph. Corrected an issue within the World Climate setup mode whereupon returning from “Load/Unload Run” or “Reset to Reference” the WCE setup mode reverted to normal C-ROADS use with all the tabs on the input pane active rather than remaining in the special World Climate mode. Edited the help text related to the Sensitivity settings. The historical data sets for CO2 fossil fuel emissions and the inclusion of recently made available historical CO2 bunker fuel emissions data have been updated in this release. Additionally, other variables have been updated with more recent data, including population and GDP, Mauna Loa data CO2 concentration data, and GISS other forcings. The GISS data were also slightly updated, which required a readjustment to the MAGICC historic values, where the adjustment brings the mean over 1880-1999 to be the same between both data sets. We have renamed the menu choices to help point out the differences and similarities. In the new “Population and GDP” tab, assumptions within the selected Reference scenario about population and GDP may be adjusted using the controls found in this new input pane. Six additional graphs have been added to the graph viewing panes. Under the “ Other” menu on the left graphs pane there are country/bloc level graphs for Population, GDP, GDP per capita and Gross World Product per capita. On the right graph pane, under the “per Capita” menu there are two new graphs for Global emissions per capita and Global emissions per Gross World product. These two variables are also present on the corresponding country/bloc level graphs as points of reference. We have added controls to enable C-ROADS to be used for facilitating the World Climate role playing exercise. With the press of a button on the main page you can set up a 6-Region simulation and activate the controls on the World Climate Exercise pane and deactivate most of the other input controls to provide a clean, simplified version of C-ROADS for use with World Climate. The controls allow World Climate type inputs of “Growth Stop Year,” “Decline Start Year,” and “Annual emissions reduction (%/year)”. Forestry inputs are also controllable as a 0-1 index for deforestation and afforestation by country or bloc. For the advanced C-ROADS user, the controls for the World Climate Exercise may be activated after initiating a 6-region run using the “Create New Run” button or by loading a previously saved 6-region run using the “Load Saved Run” button. Either will allow access to all C-ROADS control elements during a World Climate session as well as the reference scenario you have chosen from the menu. Emissions for individual countries may be entered in the standard “manual” mode rather than using the World Climate style entry allowing extensive flexibility in your use. We recently updated the Reference Scenarios (RS) to improve our methodology for downscaling from the more spatially aggregated data sources, i.e., SRES scenarios and EMF22 models. As a result, the global projections for BAU emissions remain largely unchanged but the allocation of future BAU emissions between C-ROADS regions has shifted. Specifically, our new default, which remains based on SRES A1FI, now has a greater share of the global emissions coming from the Developed and Developing non-MEF regions. As before, the user can choose among the suite of reference scenarios or base model runs on a customized, user-designed reference scenario. We have modified the Main/Welcome screen with some changes in button placement to emphasize the precedence of button function. Buttons and menus are now grouped in three categories: Settings, Simulation, and Post-simulation analysis. The Set Graph Defaults button has moved under the Settings heading which is more appropriate to its functional role. There are two ways to “enter” a simulation, Create New Run and Load Saved Run. Create New Run starts a new simulation run using the User-specified settings from the Aggregation level and Reference Scenario drop down menus and the simulator default settings for all input controls. We have removed the Update Run function as it did not add to the capabilities provided by Load Saved Run. Each of the Post-simulation Analysis functions requires a saved simulation file as its input. These are the <filename.vdf> files that you see in the “Simulation Output” and other directories. Contribution Analysis takes a previously saved C-ROADS-CP run and performs a leave-one-out analysis of the global data to determine the contributions of each country/region to Cumulative Fossil Fuel Emissions, CO2 ppm, Temperature, and Radiative Forcing. Uncertainty Analysis takes a previously saved run and performs an uncertainty/sensitivity analysis using an analysis toolset file and displays the results for multiple variables. 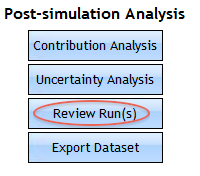 Review Run(s) is unchanged from previous versions of C-ROADS-CP but the button has been moved from Simulation to Post-simulation Analysis because, functionally, it is an analysis of previously created simulation output. Export Dataset remains unchanged and creates an Excel file containing the data from the variables displayed on the graphs. There is a new option for the aggregation setting, “1 region- Global.” Selecting this and choosing Create New Run will start a simulation in which the Emissions Targets, Non-CO2 GHGs, and Land-use Emissions controls affect emissions and land-use for the entire world. The 1-Region level of aggregation provides a means for a “quick sketch” to explore the dynamics and sensitivities of different changes to user inputs. Several of the settings have been moved to their relevant tabs—Deforestation and Afforestation baseline settings to the Land-use Emissions tab and the settings for Non-CO2 GHGs to the new Non-CO2 GHGS tab. The Fossil Fuel CO2 Emissions tab has been renamed as the Emissions Targets tab. This change reflects the nature of the controls on this tab. These controls, by default, control emissions of all Kyoto Protocol greenhouse gases, GHGs. This default behavior is changed depending on the setting of the Non-CO2 GHGs controls (below). When the Non-CO2 GHGs control is set to its default setting to follow “Emissions Targets”, the three emissions targets and the post target controls affect all Non-Land use emissions— Fossil fuel CO2 emissions plus non-CO2 GHG emissions. When the Non-CO2 GHGs control is set to follow “Reference scenario non-CO2 GHG emissions”, the Emissions Target tab controls affect only Fossil fuel CO2 emissions; the non-CO2 GHG emissions are controlled by the active Reference scenario under these conditions. The “Post target” setting determines how emissions will behave after the final target year is passed. There are 4 post target settings: Cap at target level, Continue rate to target, Resume Reference Scenario and Specify rate. The Post target behavior is itself determined by the selected target type: OFF, Ref year, Ref Scenario or Carbon Intensity. The default behavior, “Cap at target level” depends on whether the target type was set by Reference year, Reference scenario or by Carbon Intensity. When you select a target type of “Reference year”, when the target year is achieved the emissions remain constant at the target year value. If you have chosen a “Reference scenario” target type, when the target year is achieved the emissions will resume at the rate defined by the active Reference scenario. Finally when you choose a target relative to “Carbon intensity”, when the target year is achieved the carbon intensity will remain capped at the level reached in the target year. Post target setting applies to the last target type setting. Continue rate to target— the emissions rate will follow the same rate post target as it followed to hit the target. Resume Reference Scenario— after the target is reached, the emissions rate will resume the rate defined by the active Reference scenario. Specify rate— you may set the post target rate at a fixed rate between 10%/year and -10%/year. Precedence of Reference Scenario vs. User settings. For 6 and 15 region, if the Reference Scenario rate of reduction is greater than specified by the user, the Reference scenario becomes the cap. An example is shown in the figure. The reference scenario behavior is the green line. Reduction starting in 2012 (1st up-arrow) to 25% below 2000 levels by 2050 (2nd up arrow) is the red line. From 2012 until ~2020 (first down arrow) the Reference scenario is less than the User scenario so the Reference scenario predominates. From 2020 until 2055 (2nd down arrow) the User scenario is less than the Reference scenario and the User scenario predominates. At 2050, the emissions rate becomes constant at the user-specified 2050 level until approximately 2055 when the Reference scenario is lower than the user-specified 2050 level and the Reference scenario again predominates. If instead of 25% below 2005 levels, the user had specified 0% below, or 2005 levels, the Reference Scenario would always predominate and there would appear to be no model response when in fact the model response is to use the lesser of the Reference scenario or the user-specified scenario. This new tab is a new location for the control from the Settings tab, “Non-CO2 GHGs.” The options have been renamed from “Follow CO2 emissions” and “Reference Scenario” to “Fossil Fuel CO2 emissions targets” and “Reference Scenario Non-CO2 GHG Emissions”. Their functions remain the same. There is a third new capability, “Scaled Reference Scenario Non-CO2 GHG Emissions”. This setting allows you to create a scaled version of the reference scenario that will apply to the non-CO2 GHGs in the reference scenario. In addition to the new “Scaled Reference Scenario Non-CO2 GHG Emissions” capability, these settings have been disaggregated to match the aggregation level of the run: 1 region, 6 region or 15 region. They were previously only global. There are table inputs and individual country inputs available for 6- and 15-region aggregation. An example of the 6-region input below shows the active buttons when the “Scaled Reference Scenario Non-CO2 GHG Emissions” is selected for a country or region- note the red dots. The baseline settings for Deforestation and Afforestation have moved from the Settings tab to this tab so all the Land use emissions settings are grouped together. There is no change in their function. When the Land use Global settings input pane is visible, these settings are active. Conversely, when the country/region settings are visible, country/region settings are active. The settings that were active at the time of a “Save Run” will be active if you reopen a saved run, but both global and country/region settings are saved. This is a new function. You may set, using graphical inputs, three non-CO2 forcings: 1) Organic Carbon, Black Carbon, and Bio Aerosols, 2) Solar and Albedo, and 3) Ozone Precursor forcings. They are activated by a check box. Saving the model run will save the settings of the graphical inputs as well as the state of the check box. In release v2.148a.46 we have added a new directory structure that will help separate user–generated files from C_ROADS CP files created during installation. Previously, the two file genera were co-mingled and C-ROADS-CP would only read files from specified directories making it complicated for users to maintain any sub-directory organization of user files. The folder view of the new structure is shown here. 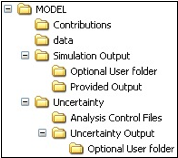 The default location when savings simulation results is the “Simulation Output” folder. Users can create additional organization in this folder, depicted by the “Optional User folder.” These new folders can have any name and there can be one or more such folders. Please note, uncertainty output generated by the “Uncertainty” functionality should not be saved in the ‘Simulation Output’ folder to avoid confusion for the user (they have the same file-type and *.VDF extension). User files are now written into two user specific folders, “Simulation Output” and “Uncertainty Output”. This directory structure separates User files from C-ROADS-CP related files to help ensure program integrity. Simulation Output Directory (Folder)– This is the default location to which files are saved whenever you save a simulation run. It is also the default location from which files are read when you select Update run, Load stored settings or Review run. If you wish you may create additional sub-directories for storing specific project output from simulation runs (e.g., “Optional User Folder” as shown above in the figure). Within the “Simulation Output” directory there is a sub-directory called “Provided output.” It contains three settings files: Kyoto 110208CP.cin, Confirmed reductions 110208CP.cin, and Potential reductions 110208CP.cin and two simulation output files, Confirmed reductions 110208CP.vdf, and Potential reductions 110208CP.vdf. These settings files were generated using the A1FI reference scenario. The settings are further detailed on the Climate Scoreboard pages of the Climate Interactive website at http://www.climateinteractive.org/scoreboard/scoreboard-science-and-data/current-climate-proposals-1 and in related pages accessed by the navigation pane on the right hand side of the web page. Confirmed proposals include official government statements, adopted legislation, and UNFCC submissions. Potential proposals include conditional proposals, legislation under consideration, and unofficial government statements. The analysis processes for Contribution analysis or Uncertainty analysis also use the “Simulation Output” directory as the default for loading saved output for analysis, but can open files from other directories also. After you have performed an Uncertainty analysis of a simulation output, you may save the result. C-ROADS-CP will suggest a filename that is a concatenation of the Simulation output filename and the Analysis Control File name which is decent way to keep track of how the file was created. If files get confused, it is easy to recreate an analysis from the original simulation as needed. When you save output from an Uncertainty analysis it is always saved into the directory, “Uncertainty Output”, regardless of whether you navigate away from this directory during the Save File dialog interaction. Once files have been saved, you may move them into your Optional sub-directories and review them later from within those sub-directories. Our goal here is to keep Simulation Output files separate from Uncertainty Output files. Both have the same file type suffix, .vdf, but they are not inter-convertible. 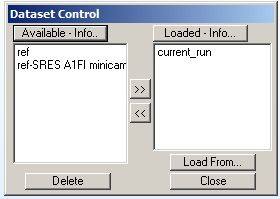 The default Reference scenario has been changed to SRES A1FI MINCAM. The previous default reference scenario will remain in the list of available references scenarios. A detailed explanation is available for download. We have added active links within the C-ROADS-CP interface to web-based files containing relevant information relative to simulator functions. While we have improved the model in numerous ways and fixed many bugs, there is still an unresolved issue. If non-English characters are used in the pathname of the C-ROADS-CP model folder (e.g., é, ñ, ø, î, å, etc. ), the directory path name cannot be interpreted correctly by the modeling software and C-ROADS-CP won’t run. We have the following two workarounds for the problem. Either rename all the folders in the directory path name so they contain only standard English characters so “Léo” would become Leo or Piñon would become Pinon. Alternatively, install C-ROADS-CP in the location, C:C-ROADS-CP v2 (that is, directly at the root of the hard drive). By avoiding non-English characters, the supporting software will operate properly. We apologize for this inconvenience that is out of our control. The underlying problem will be corrected before the next C-ROADS-CP release. Some reference scenario graph lines were incorrectly labeled as to the reference scenario source from which they were derived. Whenever a new reference scenario was used to create a new run and this was followed by update run or review run, the reference scenario was not the correct reference scenario to match the updated or reviewed run, but was from the reference scenario from the previous Create new run. Review run, Contribution Analysis, and Uncertainty analysis now generate a reference run when invoked. Review run determines the relevant reference scenario that was used to produce the run being examined and regenerates the reference scenario. Contribution Analysis and Uncertainty analysis generate a reference run based on the current selection for Reference Scenario on the Welcome screen. Some minor adjustments to GDP projections to reflect better the individual countries’ rates. We have added two new graph types that allow comparisons of runs from individual countries. The graphs are entitled “Comparative FF CO2 emissions by country” and “CO2 equivalent non-forest emissions by country group” and are found in the left graph display pane. Access to them is from the “CO2 Emissions” and “CO2 Equiv” drop-down menus. The new graphs are at the bottom of each drop-down list and labeled “Comparative FF CO2 emissions by country” and “Comparative CO2e emissions by country”, respectively. For this new graph to be convenient, you need to show only one or at most two countries at a time. This can be accomplished in several ways. On the Welcome/main screen you may click the “Set graph defaults” button and set the default to the one or two countries that you wish to view – this setting changes the simulation default until you change it again. You could also perform a “one-session” re-set in the control panel screen using the “Select regions” button; this changes the settings during the current simulation session only and then reverts to the defaults when you “Return to main” and cycle through the welcome/main screen. The most temporary method for controlling what lines display on a graph is to check and un-check the graph legend check boxes. This is temporary – even switching between graphs reverts to the default. Note that if you use the “Data table” or “Export Image/data” buttons, these will export all the data represented in the graph legend, whether the check boxes are checked or not. There is a maximum of 12 runs before we run out of name space. In the above screen shot, with the legends showing India and US for 3 conditions, “current_run” is shown because “Create new run” was used to enter the control panel, and current_run is always shown in this mode. To omit the current run, you would enter the control panel from the welcome/main screen using the “Review runs” button selecting one of the runs you wish to review, and then using the Load/unload run button in the control panel to build up the set you wish. The name of the file from which the data set is derived is appended to the country name in [square brackets], so careful naming or renaming of your saved data sets will create a more informative legend. We have also corrected a bug which prevented the scroll bars from appearing on the table entry for 15 region land use and FF emissions, as well as one that affected forestry inputs in 6 region mode. For new users, there is now a link to each of the tutorial videos from the “Getting started” page and the “Getting started” quick guide. Clicking the button opens your web browser to the link containing the video. The update includes significant new capabilities, as well as improvements to make it easier to use. There are 5 changes and additions that you’ll find at the interface level that are new or improved. There are also improvements in the underlying simulation program. At the opening “Welcome” screen you may choose from a collection of Reference scenarios, derived from EMF22 and SRES, and you may also specify your own user-defined reference scenario. When you choose “Create new run”, your chosen Ref scenario is used. The footer in the graphs will reflect the name of the Reference scenario, as will the legend in comparative graphs. There is also a reminder on the Control panel page so you can easily see the active reference scenario. Contribution analysis takes a previously saved C-ROADS-CP run and performs a leave-one-out analysis of the global data to determine the contributions of each country/region to CO2 ppm, Temperature and Radiative Forcing. Uncertainty takes a previously saved run and performs an uncertainty/sensitivity analysis using an analysis toolset file and displays the results for multiple variables – see the Help? screen. On the main Control screen, under the tab for Fossil Fuel CO2 emissions, you will find that the input controls now allow a new entry mode for each country/region, by Carbon Intensity. This adds to the previously available input modes, “Reference year” and “Reference scenario.” Finally, the OFF mode cleans up the Fossil Fuel CO2 emissions input interface when it is not in use. The “Target” boxes may be used in any order, and their order of use is controlled by the setting of the target year. 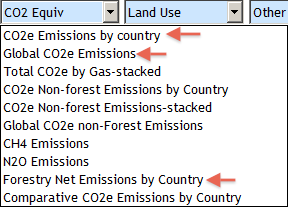 When you select the Land use emissions tab, you’ll find that you may enter these globally, as before, or by country/region. There is a table mode for the country/region entry that allows for easy review of the settings or for easy entry for multiple country/regions. The program will install in a folder, C-ROADS-CP v2, and so will not overwrite your previous version of C-ROADS from last year.